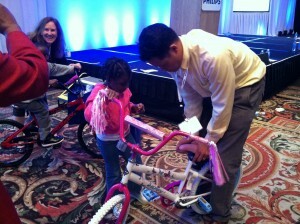 Philips Healthcare included a Build-A-Bike team building event in their annual meeting recently, held in Orlando, Florida. This was a sub-meeting of a larger, mega-meeting taking place in Orlando with the entire company. This event was held with the Ultrasound group. 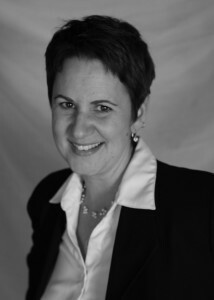 The sales and marketing team assembled comes from regions across the country, and has main offices in Washington state and Massachusetts. Orlando was a nice, warm gathering place for everyone to meet! Build-A-Bike is a fast-paced, high-energy workshop that gives participants the opportunity to interact, compete and ultimately work together to solve a series of challenges. Due to our competitive human nature, there is typically some skepticism at the notion that the teams need to collaborate to solve the challenges more efficiently. There was great energy in the room as 225 people tried to outwit each other! While this group of people don’t necessarily work together in their day-to-day businesses, they did rise to the challenge and help each other, ultimately making everyone successful. By the end of the event, they had built 36 bikes! Local kids from the YMCA of Central Florida came at the end of the event to receive the bikes. There was not a dry eye to be found! The energy level rose even higher as the adults swarmed around the kids to make sure each one fit their bike. Everyone likes to give back to the community, especially to kids in need. Including Build-A-Bike in your next conference gives those you’ve brought together the opportunity to do just that while adding energy, enthusiasm and fun!